What’s the biggest takeaway from this match? 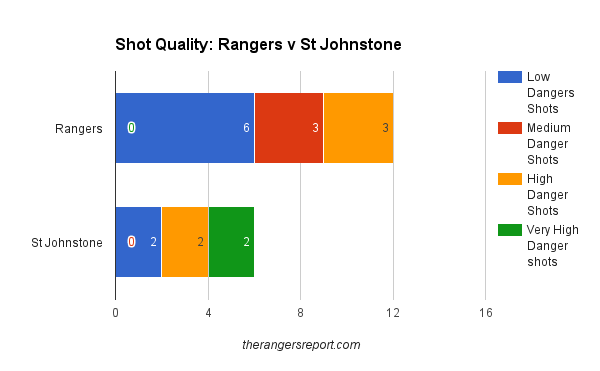 If Rangers can minimize its mistakes on defence, they can definitely compete with a team like St. Johnstone. This match was so similar to last weekend’s Hearts loss to Aberdeen, a match in which Hearts controlled possession, generated more chances, but were guilty of atrocious defensive breakdowns that the Dons took full advantage of. Like Aberdeen, St. Johnstone pounced on Rangers defensive lapses with deadly strikes that broke open the game. Then they were able to effectively stagger layers of defence in the final third to stagnate Rangers attack. St. Johnstone essentially replicated Dumbarton’s tactics from the weekend, but given their top flight experience & better talent, they were able to turn the approach into a winning result. Rangers were able to generate 50% of their shots from within the penalty area, but a couple of the shots were blocked & they never really were able to persistently break down the opponents defence. St. Johnstone effectively closed down on the ball once Rangers got into the final third & once they went ahead, basically deployed two layers of four in the final third to frustrate Rangers. That Shots on Target Ratio is what really sticks out. 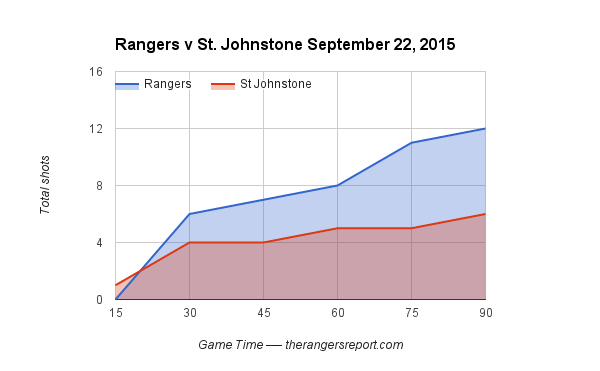 Rangers dominated possession, dominated shots, but were unable to pressure the St. Johnstone goalie into many saves. In fact, only two Rangers shots were on target – James Tavernier’s goal & a Kenny Miller shot from a difficult angle. The shot chart is basically a moot point of discussion in this match given Rangers were down 2-0 after half an hour. Foderingham played the ball long more often then he normally does (25% of the time) but that mostly came in the first half hour, as the Rangers keeper looked to relieve some of the pressure as St. Johnstone was pressuring up the pitch. Once they got their lead, St. Johnstone backed off & Foderingham was free to play short & Rangers were ceded possession up the pitch. 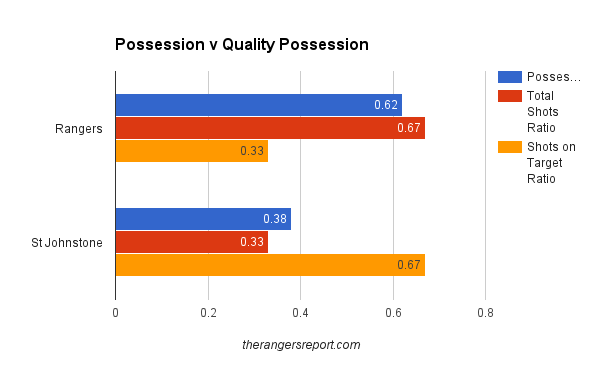 Of the balls he played short, Rangers carried the ball into the attacking half an astounding 94% of the time. Mannus played the ball long each time & the results were predictable. This is not meant to place the blame of the loss on Kenny Miller & while he showed signs of effectiveness early on, the fact that your main striker only generated one shot is worrisome. Martyn Waghorn, playing out right, managed three shots & an Expected Goals of 0.45. This number surprised me. Jason Holt appeared to struggle in the match, managing one harmless shot & did little to penetrate the final third…but to his credit he did earn more fouls then any other player besides Dean Shiels, who also earned three fouls – albeit in far fewer minutes. 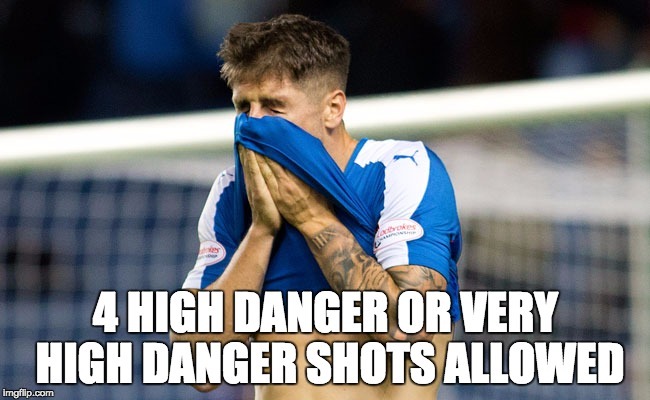 In seven league matches, Rangers have allowed 1.14 High Danger or Very High Danger Shots per match — against St. Johnstone they allowed four. There’s your bottom line. Why can` t you all just say that there were no joiners – plummers – brickie`s or plasterers playing against you after doing a hard shift on building sites. It seems to be a great leveler playing a team who train every day . ! Get real and know that you are still way below and yet your manager is still mouthing off instead of shutting up and accept that you are still the lowest of low. Ha ha. Only dimothy would be obsessed enough to come on to a rangers stats site and comment. mental. I wrote on an earlier thread, prior to last night’s game, that a reality check was required. Fans had been on phone ins saying how many goals Rangers would score and one guy even said Rangers would win (with this team) next season’s Premiership!!! St Johnstone are a hard working mid table team and frankly Rangers could not cope with them. Like last year, the best player or players is/are on loan and will, presumably, return to their parent clubs. Rangers are several players shy of being a team which could hold its own in the Premiership and those players, unless they are Bosmans, will cost a right few quid in transfer fees. Warburton, through securing some loan players at minimal cost, has bought Dave King some time, but sooner or later King will need to do what he has so far been avoiding,…………spend money! The best players are not on loan at all. Only Ball, Oduwa and Zelalem are on loan (of them, only Zelalem has been a regular starter since he arrived). Tavernier is a permanent signing and has been our best player by a distance. Waghorn is not a loan, McKay has been very effective and is also not on loan.